The Journal of European Television History and Culture welcomes paper proposals for its third issue dedicated to ‘European TV Memories‘, guest-edited by Jérôme Bourdon (Tel Aviv Univeristy) and Berber Hagedoorn (Utrecht University). 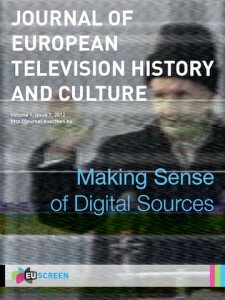 The journal’s main aim is to function as a showcase for a creative and innovative use of digitized television material in scholarly work, and to inspire a fruitful discussion between audiovisual heritage institutions (especially television archives) and a broader community of television experts and amateurs. The journal aims at stimulating innovative narrative forms of online storytelling, making use of the digitized audiovisual collections of television archives around Europe. discoveries: journalistic essays (2,500 words) which include audiovisual sources as a central component and reflect on the practical challenges of doing television research in an archival or academic environment (e.g. case studies, new collections, news from archives, audio/video interviews). Contributions are invited across disciplines and across different conceptions of memories. Particularly welcome are contributions which study television memories beyond the genres usually emphasized in the study of memory (news and current affairs and historical programmes). Paper proposals (500 words) are due on September 6th, 2012. Submissions should be sent to the managing editor of the journal, Dr Dana Mustata (journal@euscreen.eu). Articles (2-4,000 words) will be due on December 15th, 2012. Please consult the journal’s Author Guidelines. For further information or questions about this issue, please contact Jérôme Bourdon (jerombourdon@gmail.com) or Berber Hagedoorn (b.hagedoorn@uu.nl).